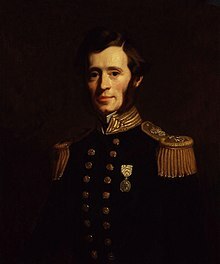 Admiral Sir Francis Leopold McClintock KCB FRS (8 July 1819 – 17 November 1907) was an Irish explorer in the British Royal Navy, known for his discoveries in the Canadian Arctic Archipelago. He confirmed explorer John Rae's controversial report gathered from Inuit sources on the fate of Franklin's lost expedition, the ill-fated Royal Navy undertaking commanded by Sir John Franklin in 1845 to be the first to traverse the Northwest Passage. McClintock's report was received comparably more favourable than Rae's, who was shunned and denied the recognition of having discovered the lost expeditions' fate. Rae's report ultimately guided McClintock to the correct area to conduct a search. McClintock also stirred controversy by with his claim that Franklin, before his death, had essentially uncovered the Northwest Passage while in reality he had not. With his discovery of Rae Strait, Rae had discovered the real ice-free passage through North America's Arctic archipelago. Francis Leopold McClintock was the eldest son of Henry McClintock and Elizabeth Melesina. His uncle was John McClintock of Drumcar House. In 1835, McClintock became a member of the Royal Navy as a gentleman volunteer, and joined a series of searches for Sir John Franklin between 1848 and 1859. He mastered travel through the manhauling of sledges, which remained the status quo when it cames to overland travel in the Royal Navy—until the death of Robert Falcon Scott in his bid to reach the South Pole in 1912. In 1848, McClintock accompanied James Clark Ross on his survey of Somerset Island. As part of Captain Henry Kellett's expedition from 1852 to 1854, McClintock travelled 1,400 miles (2,300 km) by sled and discovered 800 miles (1,300 km) of previously unknown coastline. In 1854, explorer John Rae travelled west from Repulse Bay and learned from the Inuit that a ship had been abandoned somewhere to the west. Previous expeditions had not searched the area because they thought it was ice-blocked. In April 1857, at Lady Jane Franklin's request, McClintock agreed to take command of the Fox and led a 25-man crew in a new search for Franklin's lost expedition in the area west of Repulse Bay. At Disko Bay he hired 30 sled dogs and an Inuit driver. It was a bad year for ice, and from September the Fox was beset in the ice for eight months. The following year was another disappointement, and he did not reach Beechey Island until August 1858. He entered Peel Sound, found it blocked by ice, backed up, and entered Prince Regent Inlet in the hope of passing Bellot Strait. He was glad to extricate himself from this narrow passage and found winter quarters near its entrance. In February 1859, when sledging became practical, he went south to the North Magnetic Pole—which had been found by James Clark Ross in 1831. Here he met some Inuit who told him that a ship had been crushed by ice off King William Island, the crew had landed safely and that some white people had starved to death on an island. In April he went south again and on the east coast of King William Island met other Inuit who sold him artefacts from Franklin's expedition. William Hobson, who had separated from him, found the only written record left by Franklin's expedition buried under a cairn on the northwest corner of the island. The document recorded Sir John Franklin's death on 11 June 1847, and also intimated Captain Francis Crozier and Captain James Fitzjames' plan to lead the survivors south toward the North American mainland. They also found a skeleton with European clothes and a ship's boat on runners containing two corpses. They got as far south as Montreal Island and the mouth of the Back's Great Fish River. McClintock returned to England in September 1859, and was hailed as the discoverer of the lost expedition's fate. In addition to being knighted, the officers and men of the Fox shared a £5,000 parliamentary reward. The tale was published in The Voyage of the 'Fox' in the Arctic Seas: A Narrative of the Discovery of the Fate of Sir John Franklin and His Companions. McClintock's findings were of special importance for the subsequent romantification of John Franklin's figure in British culture, since the establishment of his date of death as having occurred before the ships' abandonment, and the crew's failed trek south firmly acquitted the veteran sailor from any suspicion of cannibalism. This had been a concern since 1854, when John Rae had arrived back to London with shocking reports from Inuit sources that had greatly scandalized Victorian society, particularly Lady Franklin. McClintock's writings, on the other hand, were obsequious towards Franklin, even going so far as to celebrate his "virtual completion" of the Northwest Passage, even though Erebus and Terror never sailed through Rae Strait, the only truly navigable passageway—for a 19th-century ship—that would have allowed sailing along North America's northern Arctic coastline all the way into the Pacific.. From 1865 to 1868 he was appointed Commodore Jamaica Division and in superintended Jamaica Dockyard. From 1872 to 1877, McClintock was admiral-superintendent of Portsmouth Dockyard. In 1879, he was appointed commander-in-chief of the North America and West Indies Station the flagship HMS Northampton. McClintock retired from the Royal Navy in 1884 as a rear admiral. He died on 17 November 1907 and was buried at Kensington Cemetery. His son, Robert S. McClintock, married Mary, the only daughter of Major General Sir Howard Craufurd Elphinstone. ^ Leonard George Carr Laughton (1912). "McClintock, Francis Leopold". Dictionary of National Biography. Retrieved 6 May 2015. ^ Farley, F. M. (1973). Ordeal by Ice: The Search for the Northwest Passage. Toronto: McClelland and Stewart. p. 288. OCLC 1391959. ^ 1947-, McGoogan, Kenneth, (2002). Fatal passage: the story of John Rae, the Arctic hero time forgot (1st Carroll & Graf ed.). New York: Carroll & Graf Publishers. ISBN 0786709936. OCLC 49226113. ^ "M'CLINTOCK, Francis Leopold". Who's Who. Vol. 59. 1907. p. 1107. ^ "Admiral McClintock Dead; British Officer Who Discovered Sir John Franklin's Fate". The New York Times. 18 November 1907. Retrieved 25 July 2010. ^ "Sir Howard and Lady Elphinstone". Bagshot Village. Coleman, E. C. (2007). The Royal Navy and Polar Exploration: From Franklin to Scott. Stroud: Tempus. ISBN 9780752442075. Murphy, D. (2004). The Arctic Fox: Francis Leopold-McClintock, Discoverer of the Fate of Franklin. Toronto: Dundurn. ISBN 9781554883080. O'Byrne, W. R. (1849). "McClintock, Francis Leopold" . A Naval Biographical Dictionary – via Wikisource. Wikimedia Commons has media related to Francis Leopold McClintock. "McClintock, Sir Francis Leopold". Dictionary of Canadian Biography (online ed.). University of Toronto Press. 1979–2016. This page was last edited on 3 March 2019, at 23:47 (UTC).